The feeling of pain starts in the tiniest of nerve endings in the skin. The nerve fibres join up to form nerves which run under the skin to the spine. In the spine, the nerves form a thick rope called the spinal cord, which runs inside the bones of the spine to the brain. If something presses on or irritates the nerve as it runs between the bones of the spine to join the spinal cord, you will feel pain not so much in the spine as in the skin where the nerve started. 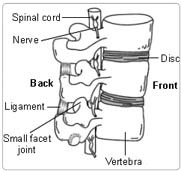 The bones of the spine (vertebrae) are like a tower of 24 hollow bricks held together by rubbery plates called discs. The spinal cord runs through the hollow centre of each vertebra. The spinal cord has a special covering called the dura. It is quite common for the nerve endings from the back of the thigh down to the foot to be pressed on by a disc bulging out between two of the lower vertebrae. This causes pain down the back of the thigh, calf and foot called sciatica and also some back pain. A mixture of two drugs is injected into your back. The injection goes around the nerves just outside the dura of the spinal cord into the epidural space. Your legs will be numb for a few hours after the injection because of one drug. After two or three weeks, the second drug, a steroid, will take effect, and your pain should lessen. An epidural injection gives long-lasting pain relief for some people. For others the improvement is only temporary. The procedure is usually performed as a day case. Other operations would not be helpful at this stage. Drugs have been disappointing. There are no major disadvantages to having an epidural. If it does not work, you will be no worse than you were before. Stop smoking and get your weight down if you are overweight. (See Healthy Living). If you know that you have problems with your blood pressure, your heart, or your lungs, ask your family doctor to check that these are under control. Check the hospital's advice about taking the Pill or hormone replacement therapy (HRT). Check you have a relative or friend who can come with you to the hospital, and take you home after the procedure. Bring all your tablets and medicines with you to the hospital. On the ward, you may be checked for past illnesses and may have special tests, to make sure that you are well prepared and that you can have the operation as safely as possible.. Many hospitals now run special preadmission clinics, where you visit for an hour or two, a few weeks or so before the operation for these checks. Your legs may be numb and weak. This lasts for a few hours only. Initially, your back pain will be the same as before the injection. The injection site should not be painful. The first hours after the procedure, the injection may make it difficult for you to pass urine and empty your bladder. It is important that your bladder does not seize up completely. If you cannot get the urine flowing properly after six hours, contact the nurses or your doctor. The injection site will have a simple adhesive dressing over it. You may remove this after 24 hours. You will be given an appointment to visit the orthopaedic outpatient department about six weeks after you leave the hospital. Some hospitals leave check-ups to the General Practitioner. The nurses will advise about sick notes, certificates etc. You may return to work two or three days after your injection. The anti-inflammatory steroid takes two or three weeks to work. Not everyone's pain improves. The improvement is only temporary for some but long lasting for others. This is a simple procedure. Complications happen very rarely. You can have some minor bruising at the site of the injection or a small blood clot on top of you spine which eventually dissolves. Infection is very rare and can be settled by taking antibiotics for a few days Extremely rarely, this procedure can cause damage to one of your nerves of your spinal cord.